People want to and can become millionaire much before retirement. Does everyone become one? The answer lies in investment strategies that wiser people follow. Following a good investment strategy along with a solid contingency plan works wonders. If you have seen anyone retiring after 30 to 35 years of service, you may have noticed a sea change in their wealth status. Especially the older generation including your parents, if employed only became a millionaire at the end of their careers. However, times have changed, and with changing times, the goal of becoming a millionaire has also shifted closer to the median of the career. Unlike the older generation, today’s generation is more into living the present than planning for future. Aiming to be a crorepati is a dream of every youth. It costs you a few commitments than just making your life comfortable every day. 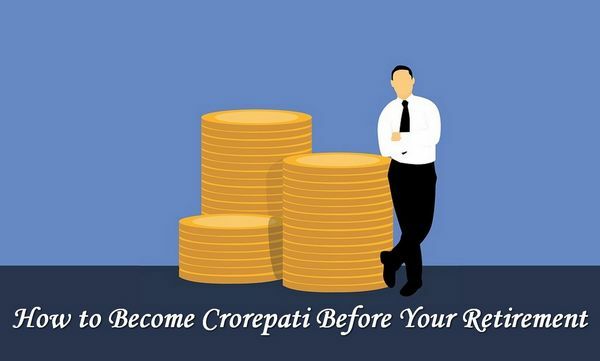 This article describes the best wealth management strategies for you to retire as a crorepati. When you start investing early, you retire early. Investing early implies that you get to spend more time for yourself than working till the day of retirement. Your end corpus also depends on early investment. Early investment is the key to multiplying wealth and earning a retirement that you deserve. In short, starting early investment helps build huge corpus. Action without a goal is futile. Similarly, investment without an objective will fetch you no result. The objective will be an amalgamation of the duration of investment, risk profile, and the premium you can pay. When you know all the three points specifically, you know exactly what you want. If you have enough time for example 25 years to retire and you want your retirement, and family get the financial protection together with wealth creation, look for the best mutual fund to invest. Other than this, you should show interest in ULIP plans. There is no gain without pain. If you have heard this phrase in the past, you know it well that there is no fruit that you can enjoy without patience. Here, the patience is a risk. With higher risk, you get higher returns, and that is how investment business works. Warren Buffet, one of the most significant investors of the age says that without risking your investment, expecting return is futile. Instead of thinking “how much money do I risk?”, start asking, “how much money do I get back?” This changes the way you look at investment. Automating investment is the process in which you allow your investment provider to automate an amount from your account to a specific investment option. This makes sure that you do not spend that amount elsewhere that gives no return. It is a human tendency to spend money that we do not use for investment assuming that is surplus after saving. This is the biggest mistake to avoid. Have you observed something interesting about crorepatis? They have powerful personalities. You need to focus on living that personality and thinking like them for sustainability of your newly earned wealth. Self-made wealthy people lead an ordinary life with high value for money. They know it is hard earned money. You need to start thinking in those terms. You should start focusing on developing your professional personality by following strict rules listed. With an early start, investors are investors while we are investment aspirants. By making up your mind in investment, you have already taken the first step. The second and the final step is following a plan that can make you crorepati if not sooner, later. After all, who does not want to lead a comfortable life with stress minus from life? Investment is the biggest plan of your life that you should not delay if being a crorepati is your big dream.